KVS PGT Chemistry Exam Guide: Hello Aspirants, as we all know that the Kendriya Vidyalaya Sangathan is going to conduct written test for 8339 posts of Teaching Staff. Candidates who have recently applied for the post of KVS PGT, now they are started looking for Best and appropriate Books for PGT Chemistry Exam. 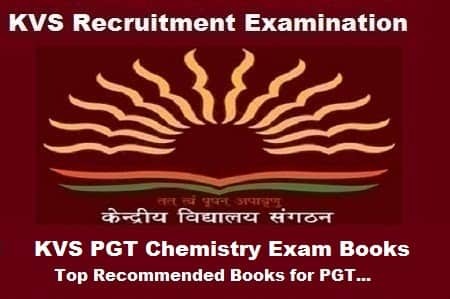 there are many KVS PGT Chemistry Books which are available for the same subject, now choosing an appropriate book according to the KVS Recruitment examination pattern is a very Crucial problem for all the aspirants. so in this article, we will provide you with the detail information about the KVS PGT Chemistry exam Preparation Books. Scope of chemistry- Historical approach to nature of matter – states of matter, properties of matter and its measurement, S. I system of units, Uncertainty in measurements, dimensional analysis, Laws of chemical combination, atomic and molecular masses. Gases, liquids and solids, three states of matter, types of intermolecular forces. The laws governing ideal gas behaviour, Dalton’s law of partial pressure, the Kinetic molecular theory of ideal gases, Maxwell Boltzmann distribution law on molecular motion. Liquid and their properties. Solids: Classification of solids, fundamental types of lattices, two and three-dimensional lattice types, Simple crystal structures, Transformation of crystal structure on varying temperature, Bragg’s law, density in solids, energy band. Reversible reactions, criteria of equilibrium, Law of mass action, the equilibrium constant, Kc and Kp, Le Chatelier principle, Ionic equilibrium, Ostwald’s dilution Law, a solution of acids, bases, ionic equilibria in solution, Common ion effect – its application to qualitative analysis, acids and bases, Bronsted- Lowry theory of acids and bases, Lewis concept of acid and bases, relative strengths of acids and bases, their quantitative estimation, buffer solution and its use. Adsorption, absorption, sorption, Physical adsorption, Chemisorption adsorption, isotherms ( Freundlich, Langmuir), application of adsorption, types of Catalysis theories of catalysis, classification of colloids, preparation of Colloidal Solution. Theories of reaction rates, the rate of reaction, molecularity and order of reaction, Fast reactions- Luminescence and energy transfer process, reaction mechanisms(Simple and complex reactions). Oxidation and reduction, redox reaction and its application, oxidation number, Strong and weak electrolytes, activity coefficient, conductance and conductivity, Kohlrausch law, resistance and resistivity molar conductivity, equivalent conductivity, Qualitative and quantitative aspect of electrolysis. Valence electrons and Lewis structures, Ionic bond, Covalent bond, Bond parameters ,Co-ordinate bond, polarity and dipole moment, Quantitative idea of – valence bond theory, molecular orbital theory (LCAO), Concept of hybridization involving s, p, d orbitals, Hydrogen bond, Resonance. Macroscopic properties of the system, modes of transfer of energy between system and surrounding, Phase transition, phase rule and phase diagram, First Law, second law and third law, of thermodynamics. The position of Hydrogen in the periodic table, occurrence, isotopes, Preparation of hydrogen, on the small and commercial scale, hydrides, water, hard and soft water, heavy water, hydrogen peroxide, hydrogen economy, hydrogen as a fuel. Principles and methods of extraction, oxidation and reduction as applied to the extraction procedures of Al, Cu, Zn and Fe. Electronic configuration, variation in physical and chemical properties of groups 13 to 18, physical and chemical properties of borax, boric acid, boron hydride, silicones, preparation and uses, preparation, properties and uses of nitrogen. Meaning of coordination compounds, Werner’s theory, ligands – their types, IUPAC nomenclature of coordination compounds, isomerism, bonding in coordination compounds, colour, magnetic properties and, stabilities of coordination compounds. Some Basic Principles and Techniques: General Classification of organic compounds, Shapes of organic compounds-Hybridisation(sp, sp2,sp3), Structural representation of organic molecules, Functional groups, Homologous, series. Common or trivial names, nomenclature of aliphatic, aromatic and substituted aromatic compounds. Cleavage of a covalent bond, Types of attacking species, electron movement in organic reactions, electronic displacement in a covalent bond and types of organic reactions. Methods of purification of organic compounds: Qualitative analysis, Quantitative analysis., estimation of the elements and determination of empirical and molecular formula. Environmental pollution, Atmospheric pollution, Tropospheric pollution(Air pollution), Major air pollutants, Control of air pollution, Smog(Chemical and Photochemical smog), Stratospheric pollution: Ozone layer and its depletion, Acid rain, Green House Effect and Global warming, Water pollution, Soil pollution and Industrial waste. Classification, methods of preparation of haloalkanes and haloarenes, their physical properties, tests to distinguish between alkyl and aryl halides, mechanism of SN1 and SN2 reactions, elimination reactions (Saytzeff Rule, E1 & E2 mechanism). Poly halogen compounds: Preparation and properties. Classification, preparation, properties and uses, tests to distinguish between primary, secondary and tertiary alcohols. Distinctions between alcohols and phenols. Preparation of ethers, physical and chemical properties. To download the complete syllabus and concern topics of KVS PGT Chemistry Subject please click on the given link: Click Here.